opening a business or even opening a bank account, train pass, having investment schemes like provident fund, mutual fund, fixed deposits and much more. However, there is one important rule which a citizen must follow. As per Section 139AA, every person who is eligible to obtain Aadhaar is required to quote this number in the PAN application form. 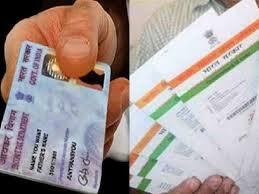 If any person does not possess the Aadhaar Number but he had applied for the Aadhaar card then he or she can quote Enrolment ID of Aadhaar application Form.